Box Text: To Determine the fate of an empire, you must conquer the New World. 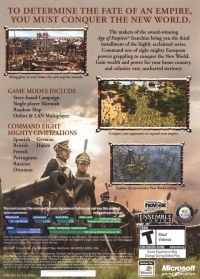 The makers of the award-winning Age of Empires franchise bring you the third installmentof the highly acclaimed series. Command one of eight mighty European powers grappling to conquer the New World. Gain wealth and power for your home country, and colonize vast, uncharted territory. 05-07-2017 tripredacus Box Text To Determine the fate of an empire, you must conquer the New World. 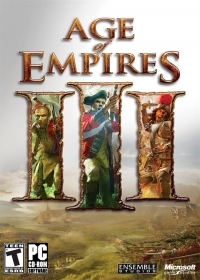 The makers of the award-winning Age of Empires franchise bring you the third installmentof the highly acclaimed series. Command one of eight mighty European powers grappling to conquer the New World. Gain wealth and power for your home country, and colonize vast, uncharted territory.